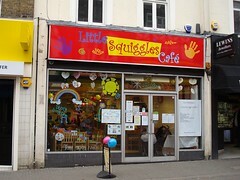 Now closed; was a children's cafe in Sutton. As of September 2014 the premises are vacant photo. The information below is retained for historical interest. The interior photo is cheerful and colourful. There's seating for around 30 people on upright chairs at wooden tables, and a sofa or two as well. An enclosed play area further back holds a ball pool and other toys, and there's also a freestanding slide. Right at the back there's a "buggy park" for pushchairs and prams. Kake and friends (including a 2.5-year-old and a 9-year-old) visited on a Thursday afternoon in February 2013. It was fairly full when we arrived around 2:30pm, with only one or two free tables, but got quieter over the next couple of hours. They were doing free face painting (possibly because it was half term), which one of our party took advantage of. The menu consists of sandwiches, pastries and cakes, and a small choice of hot meals such as spaghetti bolognese. They sometimes have gluten-free items, but had sold out on our visit. We shared one of their children's "snack boxes" (these let you put together different menu items for a fixed price) — £5.20 got us a tuna sandwich (generously filled and nicely seasoned), a "fruit bag" (satsuma segments with green and black grapes), a packet of crisps, a chocolate brownie, and a soft drink. A very generously sized pot of tea was £1.90, and they provided soya milk instead of cow's milk at no extra charge. Child-friendliness: Obviously, the entire purpose of this place is to accommodate children. But it's worth mentioning the "buggy park" at the back of the room, the stairgate on the steps to the loos, and the step-stools and seat adapters in the loos themselves. Accessibility: A small step to get in. It's quite small and crowded inside. The toilets are up a small flight of stairs. Last edited 2014-09-08 18:05:01 (version 3; diff). List all versions. Page last edited 2014-09-08 18:05:01 (version 3).